One of the problems with having a blog about content marketing is that people want to constantly post guest articles on my website. And just like the spam connections I get on LinkedIn, these all follow a certain formula. I enjoyed reading your blog post at URL, and thought you might be interested in an article about TOPIC. We just wrote an article about SIMILAR TOPIC and thought you might want to post it on your blog. And no, I’m not exaggerating. I get two or three of these messages per month. They all follow the same formula, they all want to publish something that is sort of tangentially related to what I write about (content marketing and writing), and they all praise an article they never actually read. But I got an email last week that may qualify as Worst Email Ever. I could tell that not only was the entire process automated, the author hadn’t actually read any of the information he purports to have read. This is what I got. If you like the recipe we’d be humbled if you cited us in your article. Of course, we will also share your article with our 50k newsletter subscribers and followers across our social platforms. Besides, my mom made the best beef stroganoff! Four issues told me that J— hadn’t read anything. The “article” he supposedly read is a Tags link on my blog. You can click a tag on any blog and read all the articles that have been tagged with that keyword. So it’s not an article, it’s a whole list of articles. He would know that if he had even briefly skimmed that page. The “solid post” he’s read in the past? It’s a URL for Beef & Boards Dinner Theater. Beef & Boards used to be a national chain of dinner theaters that closed down. The only one left is in Indianapolis, Indiana. The URL is to an entire website, not a single blog post. The article he wanted me to link to was about how to make beef stroganoff. And why? Because I wrote an article about a place called Beef & Boards. Again, if he had read my blog, he would see there are no recipes; if he had read the actual article I wrote, he would have seen there’s no mention of food. This was the first and only article I ever wrote on this blog where I mentioned Beef & Boards, and it was based on an interview I did with an actor in a show at that theater. I was a travel writer for several years, and I wrote about Beef & Boards shows on other blogs, but I never did a theater review on my work blog. J— would have known that if he had read other articles; he clearly didn’t. 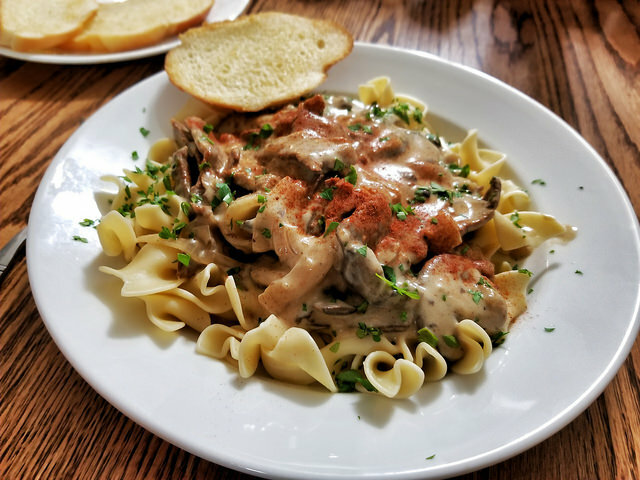 So I wrote back to J— and said that while I was not interested in publishing a beef stroganoff recipe on a blog about writing and content marketing, I would make sure his request appeared on my blog rather soon. To those of you doing blogger outreach, please please PLEASE write individual letters to your contacts, not form email. Don’t find a way to automate this so you can do more faster. This is not something where you want to pump out hundreds and thousands of emails every week. If you’re only going to get a 1% success rate, the trick is not to send out more spam, it’s to give your efforts a more personalized touch. Reduce the number of people you contact, and don’t waste the energy and effort on contacting people who aren’t a good fit for what you do. Look, you already have a job where you sit down all day and the only things you move are your fingers. Don’t find a way to be more lazy about it. If you say you read an article, make sure you actually read it. Quote something from it. And not just the opening sentence. Talk about why that article is important to you. If you’re going to send any links, copy and paste them into your browser and then test them. Make sure you grabbed the right link, and that it actually works. Tell the other person why you think your article would make a good fit on their blog. It shows that you read more than one, which means you’re actually interested in them. They’re more likely to accept your request that way. Blogger outreach is tough because you’re writing to people who aren’t likely to write you back. But that doesn’t mean you should take shortcuts or automate the process to make it easier. I’d be willing to wager that you’d get a better response if you wrote 10 individual emails per day than sent out 100 automated messages.